Batt. 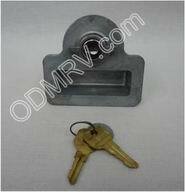 Box Key LL432 [LL432] - $5.95 : Out-of-Doors Mart!, More Airstream Parts on-line than anyone! LL432 Battery Box key for 1977-1989 Airstreams, and some access doors. See Picture below.